These days, more and more skin packs are conquering the retail shelves around the world. The advantages of the skin packaging system are obvious: securely sealedunder deep vacuum, food products have a significantly longer shelf life and can bepresented in a much more attractive way. By launching FlatSkin®, SEALPAC nowoffers a revolutionary solution that combines the sought-after skin packaging process with a plastic reduction of up to 75%. 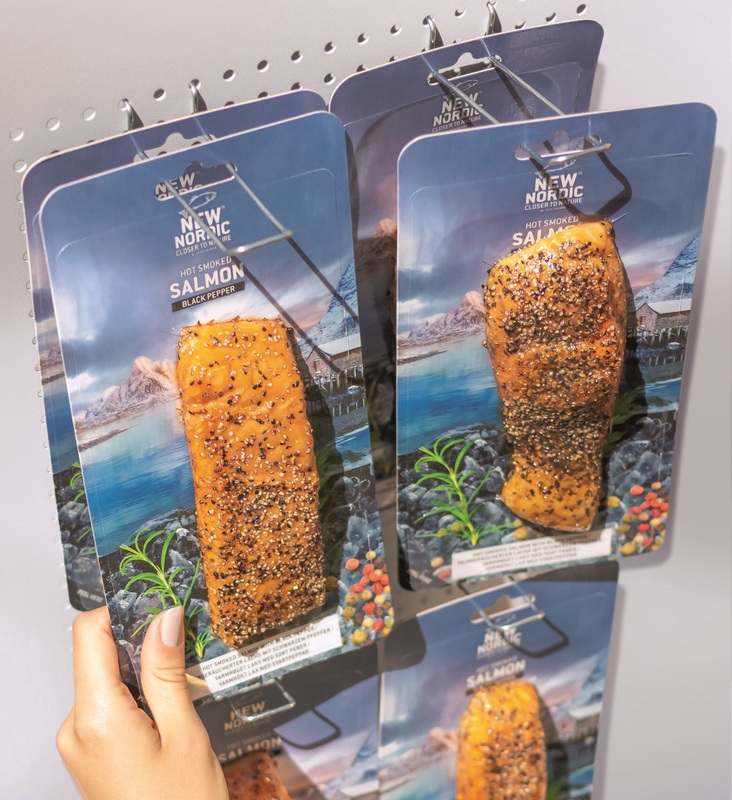 Danish seafood processor VegaSalmon A/S is one of the early adopters of the FlatSkin® packaging system for its hot-smoked salmon products. SEALPAC’s recently developed FlatSkin® system combines an attractive product presentation and extended shelf life with a highly sustainable use of packaging materials. Instead of common plastic skin trays, the FlatSkin® system uses cardboard carriers that allow for double-sided printing, hence offering optimal space for product information whilst providing unique branding opportunities. Some manufacturers may even dispose of their traditional cardboard sleeve. A highly transparent barrier skin film fixates the product directly onto the flat cardboard carrier, which has been coated with a polymeric protective layer. This layer provides stability to the cardboard and forms a reliable barrier against grease, moisture and oxygen. FlatSkin® packs are perfectly suited to vertical presentation (e.g. hanging or standing), making them true eye-catchers at retail. In addition, the tight-fitting skin film provides an attractive 3D effect that highlights the content to the fullest. The FlatSkin® system uses cardboard carriers made from bleached or unbleached fibre, which can be printed on both sides by means of low-migration printing inks and varnishes. After taking out the product, the thin polymeric layer is easily removed from the cardboard to allow for separate disposal. As such, the FlatSkin® system achieves a plastic reduction of up to 75%, hence providing an answer to the food industry’s increasing demand for sustainability. FlatSkin® is suitable for a wide range of product segments, such as fresh meat, cheese, poultry and seafood. Renowned Danish seafood processor Vega Salmon A/S (www.vega-salmon.dk), with its head office in Kolding, is one of the first users of the FlatSkin® packaging system for its hot-smoked salmon products, which it supplies under different brand names to various retailers. The products are manufactured on a SEALPAC A10 traysealer with 8-impression tooling for cardboard carriers measuring 260 x 130 mm. Each carrier has a double-sided print and hanger hole, which, combined with SEALPAC’s unique OnTrayCut system, allow for an attractive vertical presentation at retail.